The all-new 2018 Mercedes-Benz V-Class which delivers style, comfort and spaciousness has been launched by giant automobile dealer, Silver Star Auto Ltd (SSAL). SSAL, authorized distributors of Mercedes-Benz vehicles in the country continues to introduce unto the market the latest range of Mercedes-Benz vehicles as it unveils the 2018 Mercedes V-Class, a new benchmark in the segment with its unique look, intelligent assistance, safety systems, innovative multimedia concept and a powerful drive system. 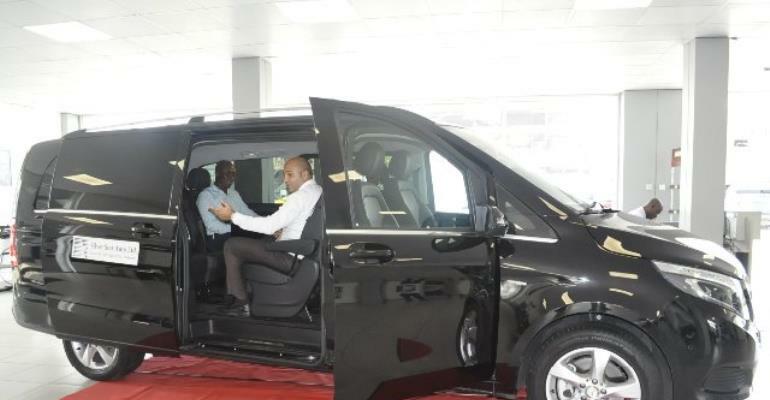 Introducing the new vehicle, Chief Executive Officer of SSAL, Mr. Nouhad Kalmoni pointed out the Mercedes-Benz V-Class versatility is a target for the market. “Due to its innovative systems and spaciousness, the V-Class is a perfect business and family vehicle, has a powerful engine and a flexible seating concept that makes it the perfect platform for all users. “The all-new 2018 Mercedes-Benz V-Class comes with a V 250 petrol engine with a 211 horsepower 4 cylinder engine, an unrivalled design with reflection-type headlamps and it really makes a statement with the exterior sports package, which also includes 20-spoke light-alloy wheels and comfort suspension with higher ground clearance. The automated sliding doors softly closes at a touch of a button with full control by both the driver and passengers. Also included is LED intelligent Light System and separately opening rear window with partitioned load compartment” he highlighted. Mr. Nouhad Kalmoni presented the three equipment lines, V-Class, STANDARD AVANTGARDE, EXCLUSIVE and AMG Line which all boast of an innovative multimedia system, telephony, luxury seats, a leather-look instrument panel and decorative topstitching. Mr. Kalmoni urged the hospitality industry, rental services and businesses looking to travel in style on business or leisure to come and test the all new Mercedes-Benz V-Class, which guarantees flexibility, comfort, luxury and a seating concept that includes a table for on road face-to-face business meetings. He assured customers that, Silver Star Auto ltd. is well positioned to deliver stellar Sales and After-Sales service of all Mercedes-Benz range including the new Mercedes V-Class with quality and affordable spare-parts to complement in its Accra, Tema and Kumasi branches. Guests present were ushered into the new vehicle by Mr. Rabie Agha, Mercedes-Benz Sales Manager at SSAL.